Hello to all of you! I just got back from my vacation which also included the Stampin' Up! convention in Salt Lake City with one of my best friends and upline Christine Bellow aka the Stampin' Ninja. 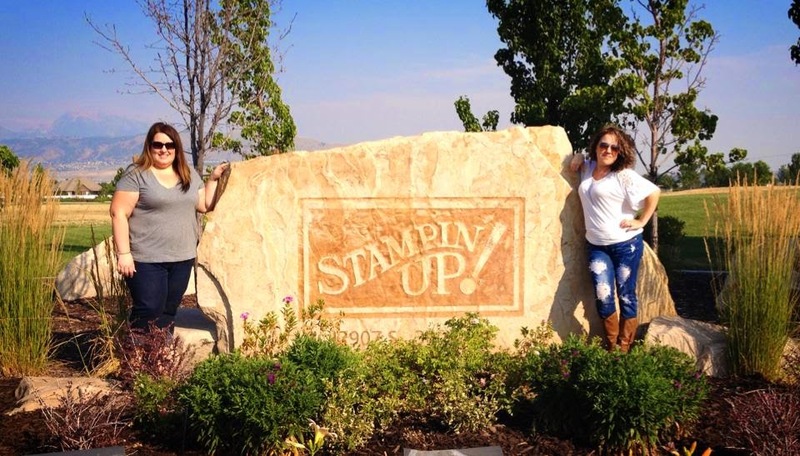 Here we are at the famous sign right outside of the company headquarters in Riverton, Utah! Such an amazing experience that I will be sharing with all of you this week. 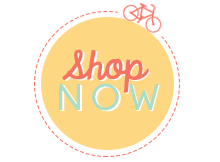 I have AMAZING new product announcements, the launch of the holiday catalog (squeal! ), and many other goodies so stay tuned every day this week. 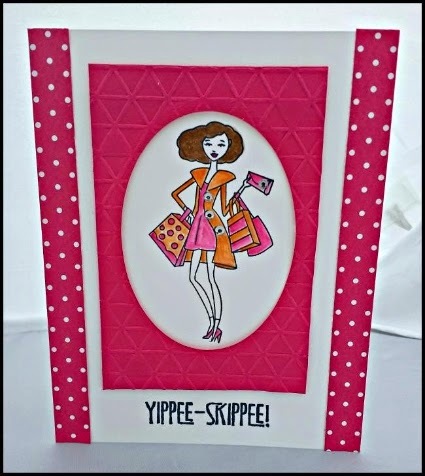 Here is a super cute card that uses the stamp set In This Together and the sentiment (one of my faves) is from the set Yippee Skippee. This is a versatile card that you can use for a celebration, birthday, etc. and it so simple to make! Emboss Melon Mambo piece with the Tiny Triangle Embossing Folder; cut out oval using 3rd loargest oval from the center. 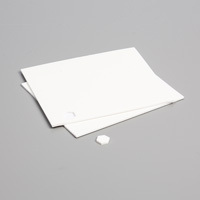 Adhere half-inch strips of Designer Paper on either side of folded Whisper White card. 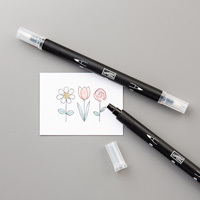 Using a piece of tape, cover the sentiment on the In This Together stamp and ink up image using Memento Black ink pad; remove tape and stamp the image onto the folded white card using the "back side" of the Melon Mambo piece as your guide. Tip: use the back side of the Melon Mambo mat in case you accidentally get ink on the cardstock. Color in image using the Blender Pens and the lid of the ink pads. Adhere the Melon Mambo mat over the colored image using Stampin' Dimensionals. If desired, add small Rhinestones on the coat buttons & purse clasp to finish. VOILA!